This week we’re introducing a new regular column for 2018, focused on legal issues for creatives. To kick things off, let's take a look at trademarks. Trademarking your business name can help ensure your customers identify your product or service as unique, and ensure your business is – and remains – distinguishable from all others. Are you thinking about changing careers? Perhaps you’ve been wanting to take up your creative pursuit full time and quit your day job, or maybe you’re taking the leap to start your own business, or doing further study to advance your career in a new direction. Whatever your situation, career change can be a minefield. Once you’ve made the decision to move onto something new, it can be difficult to know to where to start. Should you enrol in a course? Create a website? Ask around for advice and find a mentor? Or should you be networking like crazy to get your foot in the door? All of these options are important when starting afresh in a new industry, job, or business, and it’s easy to concentrate on the practicalities and neglect to pause and look inward first. But career change, like any major life change, requires cultivating skills that we don’t always think of as relevant to our working lives. So take a look at the steps below before you touch that LinkedIn profile, CV, or website theme. When at a career crossroads, it can be useful to pause and reflect on the bigger picture of your life. This is your chance to plan your career and work around the life you want to create for yourself. What sort of hours do you hope to work? In what sort of environment would you like to spend your time? How much money do you want/need to earn to keep up your security and lifestyle? How much time would you like to dedicate to your family, social life, and volunteer or “passion projects” outside of work? In other words, it’s a good time to think about what sort of life you want, not just what sort of job/business you want. What is your ideal life, and what sort of working life will help you fulfil this in years to come? Let’s face it, it can be hard to tune out the voices of criticism when you’ve decided to go against the herd and start something new. There will be plenty of people who try to tell you that you can’t—or shouldn’t—do it. The quicker you learn to shut out those voices, the better. One of the biggest mistakes we all make when initiating a big change is to seek out advice…from anyone who will listen. This invariably leads to a melting pot of opinions that can be confusing at best and discouraging at worst. People project their own fears onto you if they feel threatened by your bravery (because you are taking a brave new step!). Instead of asking anyone and everyone whether they think you should take the leap and how you should go about it, seek out people you know will champion you. They are the ones you want to hear from; simply tune out the rest. And then concentrate on building your confidence and reminding yourself of your strengths and how they can be applied to your new role. Particularly if you’re looking to leave the world of nine-to-five and pursue your own freelance career or business, you’ll need to recalibrate your working style to ensure you can self-motivate when external deadlines are not present. Even if you’re just looking to move from one industry to another, you’ll need self-discipline to get yourself up to speed on developments in that area, market yourself properly, and get out and meet people who can help you succeed in your new field. Develop a singular focus (eyes on the prize!) and remember why you set out to do this when there are a million other tasks and fun plans vying for your attention. You probably already know that this career change business is uncomfortable. From the very beginning, even before you’ve made the change, planning to take this sort of leap requires stepping out of your comfort zone. You’ll have to learn new things, develop networks, and put yourself out there in a way you may not have had to do for years (if ever). The good news is that being uncomfortable equals growth, which is exactly what you want: to grow into your new career. Not to mention the fact that once you get comfortable with being uncomfortable, you will find this serves you for years to come as you continue to learn and grow and take on challenges in your new role. Discomfort may not be our preference, but when it comes to creating the career you want, it will be worth it. Bec Mackey is a writer, teacher, and producer of screen-related things. She uses a decade of experience in the business sides of media and arts to help creative people fund and promote their work in ways that work for them. Bec writes about funding, promotion, creative careers, and life on her website, Brightside Creatives. Rachel Devine is an award-winning photoblogger and professional children’s and lifestyle photographer. Her blog, SesameEllis.com, and Instagram feed attract fans from around the world with candid, compelling images of family life. She has authored and co-authored three books on photography, and last year, her project Within the Keep, featuring portraits of tween girls paired with words each girl chose to define herself, won both an Olympus Vision grant and a 2016 Bupa Blog Award. A native of Los Angeles, Rachel moved to Melbourne nine years ago and calls Australia home. Can you tell us about your background and how you fell in love with photography? I started when I was a teenager—self-taught, on film. I couldn’t draw well, so photography was my creative outlet. In 1995, I opened my business in Los Angeles, photographing kid modeling portfolios and headshots. My claim to fame was photographing Miley Cyrus! After moving to Melbourne, I met a woman named Simone Ryan, who represents kids’ clothing brands. That was my entry into the kids’ clothing world in Melbourne. How would you describe your work and creative inspiration? I take pride in the fact that you can look back at images I shot twenty years ago, even on film, and it’s hard to date them. With the clean lighting, true colours, and classic style, you would think I shot them yesterday. I love that. Light inspires me. I am such a fan of light—and dark. When the light comes into my bedroom in the afternoon—especially fall light, the stripes of light through the blinds on the white wall—it’s just so pretty. I can see a photo just by looking at the light. That’s how I’m constantly looking at the world. Do you have any simple advice about taking better photos, whether for social media or to sell products? Learn how to photograph in balanced, flat light without it being dull, and also avoid “hot spots,” which are overly bright areas (as opposed to dark areas). 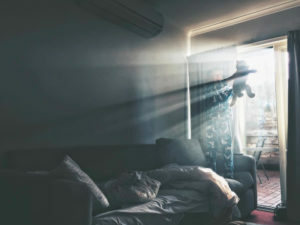 You can find flat, filtered light in a doorway, just underneath a porch, or by placing your items next to a window with a sheer white curtain. Or, coat your windows with yogurt! If you use a roller to paint your windows with sugar-free low-fat yogurt (not no-fat, which is too milky), it becomes sort of a frosted window. You get light through it but you can’t see out. It’s amazing. When you don’t want the yogurt on there anymore, spray the window with water and wipe it down. If you want to show something simply and beautifully on Instagram, there’s that slightly unsaturated look with lots of white—white backgrounds with one simple object in the photo—that works well. Just keep everything simple and have a clean, consistent look, whether it’s slightly unsaturated or neon coloured. Which social media channel has been the most effective for you, and why? Instagram. For me, it has been about interacting with people. It’s not just putting my stuff up there and hoping they’ll show up. I find hashtags that I like and then click on them and “like” pictures that appeal to me. I just like what I like and engage as if nobody was looking. If you think of it as a community and not an audience, you build respect by actually interacting as a human being with other people in the community. Do you have help running your business? I don’t have physical assistants, but I have upgraded to systems. I pay for a program called Studio Ninja that I highly recommend. It’s a Melbourne-based customer management back-end service that does quotes and invoices, job tracking, all that. It makes my life so much easier. I also use CoSchedule for my blogging stuff. Like many of us, you are juggling a creative business and a family. What is your favourite tip for “making it work”? The best decision I made was saying that I work from 10–2, drawing the line at school hours. I’m lucky in that I can do the school run and be here in the evenings. I don’t feel that I’m working all the time when the kids are around. Have you ever taken a risk or tried a strategy that didn’t turn out as you’d hoped? If so, what did you learn from the experience? There are tons. Everything has a learning curve. What I try to remember is that every bad thing will pass—and the good stuff will as well. When something goes wrong, I take those moments in just as I do when something’s going awesome; I know it won’t last and I want to get everything I can from it. As painful as some of it might be, I can still learn from it and absorb life lessons. You’re American but have lived in Australia for nine years. Has being an ex-pat shaped your art? Being an ex-pat has had a huge impact on my art. While everyone here speaks English, it’s a different world. It’s similar to home but it’s not home. I’m always looking at things slightly left of center. Also, I have a slight sense of longing all the time, being far from friends. There’s a Japanese word for that bittersweet appreciation of time passing, and I’m constantly aware of that. It seeps into my images. Probably the biggest issue I struggle with is that I’m not considered an Australian blogger photographer, but I’m not an American one, either. I consider myself more Australian than American—at least politically. I enjoy and celebrate the opportunities people have here. What are you looking forward to doing in your business this year? I’d like to take my Within the Keep project to a larger audience. I’m also working on a visual storytelling journal for kids to help them tell their own stories. I love how photography crosses nationalities, language barriers, intellectual barriers—all those things. It’s universal. Favorite podcast: I have yet to find a podcast I can listen to! Most inspiring friend or family member: My father, who passed away in 1999. He was the one who said, “Photograph. I’ll pay for the lab bills”—and look what he’s done. I think about him all the time, every time I pick up a camera. For more about Rachel, visit her blog, Facebook feed, or follow her on Instagram at @sesameellis. To join Rachel’s Photographing Happiness group, where she helps members document their daily moments of happiness, visit the group’s Facebook page. Julie Mazur Tribe is an editor and book publishing consultant who loves working with authors, books, and creative ideas. She can be found at BrooklynBookStudio.com or on Instagram at @brooklynbookstudio. Can you believe it is nearly the end of 2016? Gah! I feel like I only just recovered from last Christmas. We are getting ready to take a well-deserved blog break over the holidays, so have prepared a round up of our top posts over the last year for your reading pleasure! Bookmark this post to read later on the beach, in a hammock, or on the couch over a glass of eggnog and the shortbread biscuits meant for Santa. I am writing this blog post while also preparing for a trip from my hometown in Hamilton, Victoria, to Sydney. So it really is a good time for me to think about what is means to be a creative person living outside of the city and how I have gone about finding and generating creative work opportunities. What is a brand? A brand is more than just a logo. A brand is who you are. There are five fundamentals that form a brand. One cannot exist without the other, and for a brand to be successful, the fundamentals must work together to communicate everything you think, say and do. Being organised is a skill. It’s something that you can learn and refine but it doesn’t always come naturally. I have always been an organiser since a very young age. Today in my day job, that is exactly what I do. I plan and manage projects from start to finish and all that stuff in between. You may be lucky enough to have a specialist around you who will do this, or like many small creative businesses have to become a bit of a jack of all trades and apply this skill to what you are doing. Here are a few of my tips to help plan away. You’ve been working on a creative side gig alongside your main job for a while now. You’ve got a few regular clients, are making money and are in demand. Most of all, it’s so fun and rewarding that you spend all your lunch breaks and evenings working on your ‘hobby’. If this sounds like you, it might be time to take a leap and pursue your creative project full time. Working for yourself or passionately following a creative project requires a level of mental toughness and self-confidence that is hard to maintain. Dealing with rejection, financial challenges, working long hours with just yourself as taskmaster… all these things can build up until you are having an existential crisis before your morning coffee.